There’s nothing revolutionary here, but this phone offers a solid design made with good quality components and a decent enough spec. The dual SIM with microSD card capability and global channel support makes it ideal for any international adventure holiday. We don’t know exactly how many Chinese phone makers are out there, but there’s a lot of them, that’s for sure. Today, we’ll be looking at a handset from Ulefone, one of the bigger phone makers in that region, with a large selection of models. Online Chinese retailer, Gearbest, provided the sample and sells the Ulefone Armor 3 $259.99 at the time of writing. Note that, while this price includes delivery, it is exclusive of any taxes that may be levied by HMRC or the courier companies on behalf of the vendor. Want to buy tech from online Chinese retailers? Read this first. In the Ulefone range are cheap 3G starter phones, more powerful phablets and the Armor products that are designed to handle less than ideal environmental conditions. This series now includes the original Armor, Armor mini, Armor 2, 2S, 3, 3T, X, X2, and Armor 5, and our review covers the recently released Armor 3. From the outside, the Armor 3 is strongly reminiscent of other Chinese-made rugged phones we’ve covered recently. Indeed, the design of this phone is very similar to the Doogee S80, although the Ulefone handset has a marginally smaller screen, and as a result, it weighs a little less. That said, this is a substantial device that tips the scales at nearly 365g, and you still wouldn’t want to drop this on your foot. To avoid that scenario, Ulefone has given the metal sides large bevels that make gripping it much easier – also making the phone more comfortable to hold. The designers of the Armor 3 went with a slightly unusual button layout with the volume rocker on the left, and the only button on the right-hand side is the power. This choice allows the fingerprint reader to be on the right-hand edge where a right-handed person can easily use their thumb to unlock the device. The left side has a PTT (push-to-talk) button for use with a walkie-talkie option, and surprisingly no SIM card slot. It took us some time to work out where the SIM slot was, the clue being the small Torx screwdriver included in the extensive library of accessories for this phone. You see, on the back, below the rear camera, is a large metal plate adorned with the Ulefone logo, and four screws holding it very firmly in place. You’ll need to remove this plate with the screwdriver to reveal two SIM slots and a place to add additional storage via a microSD card. Many of the dual SIM phones we’ve seen recently could either use two SIMs or one and a microSD card, but this design can accept all three simultaneously, which is good to see. Along with the screwdriver, Ulefone includes lots of accessories in the box with the phone, such as two different power adapters to enable you to change it with a USB charger, if you forgot the Type-C one provided. The Type-C cable is a high-quality affair with some cable management clips that are most welcome. There is also a wrist strap that can attach via two loops on the back of the phone, and a rubberized mounting frame that has a clasp designed for putting it on the handlebars of a bike. The only missing item is an antenna for the walkie-talkie, which we assume only comes with the 3T version of the phone. We can’t say if it is possible to source that antenna and make this feature work, but the threaded connector for it is on this handset. Overall, our initial impressions of this phone were good. It’s solidly made, has a large and colorful screen, an excellent specification and many genuinely useful features. The Armor 3 comes either as entirely black or black with orange highlights, so you can always plump for the latter if you prefer a more sporty appearance for your phone. The specification of this phone mirrors a large number of Chinese-produced devices we’ve seen. They all use the MediaTek MT6763T (Helio P23) octa-core processor and ARM Mali G71 MP2 GPU combination, and on the Armor 3, this CPU is clocked to its maximum 2.5GHz. This SoC is outshone by the latest Snapdragon designs, but unless you must have the fastest possible phone, it’s more than enough power to drive this device. Our benchmark tests (see below) revealed that it is slightly faster than most of the phones that use this SoC which we’ve tested, due to a little extra clock speed and the better quality flash memory in this design. The Android Oreo 8.1 installation on this phone purrs along nicely with 4GB of RAM, and the 64GB of standard storage can handle lots of apps and data before you need to consider adding a microSD card. The screen is an IPS panel with a natural resolution of 2,160 x 1,080, making it very suitable for reviewing pictures or videos, and providing excellent clarity. But there are two features in here that overshadow the rest in their usefulness, the first of those being the surprisingly good camera. The Sony-made IMX230 Exmor sensor can snap single images in 6,144 x 3,456 resolution with very good color saturation and focus. It’s a three-year-old chip, but still very competitive and at the heart of many cameras and phones. Our only reservation is that in this context it only offers 1080p video capture and not the 4K resolution that the sensor is capable of. A custom camera app has three basic modes: picture, video and panorama. Picture mode has HDR, self-timer and the ability to capture sound when taking snaps. Sound capture is also available in panorama, and that mode has a simple but effective guide system for aligning the images that generated some excellent results. If you can’t take a few decent holiday pictures with this hardware, then you’re not trying very hard at all. The other feature that is a higher specification than we were expecting is the mobile communications platform that is truly global in the channels and ranges it supports. In theory, you should be able to use this phone in any country, because it handles 2G, 3G and 4G-LTE across a very large range of frequencies. It can also operate both SIMs on LTE at the same time, although we’re unsure if it can channel bond the bandwidth in this mode. Overall, there is very little wrong with the spec of the Armor 3, unless you are specifically looking for a gaming device or 4K video recording. About the only real negative thing we can say regarding the Armor 3 is that it’s on the heavy side. When you add the charger and various cables, the total weight of this device will be close to half a kilogram. That might not seem much, but for anyone trekking on foot, that’s a weight you’ll need to carry around with you everywhere. As an Android phone, the Armor 3 is a decent performer and generally responsive. The Oreo operating system is mostly vanilla, although it has some bundled tools such as a flashlight, FM radio and a Toolbox application that has numerous functions which we’ve seen on other Android 8.1 installations. We benchmarked the Armor 3 using our standard selection of performance testing tools and found that it delivers numbers that are in line with other phones that use the same Helio P23 processor. It’s a tiny bit quicker than most, but only by a small amount. One strong point that came out of the tests were the very strong battery life scores, revealing that this phone should last a very long time on standby, and also have an extended operating life. That fits well with the adventurer-friendly nature of the design. One aspect we couldn’t test in practical terms was the IP68/IP69K rating. To achieve IP68 a phone must handle being submerged in a meter of water for 30 minutes. The Armor 3 goes much further than that, handling twice that depth for up to two hours! Ulefone also mentions the MIL-STD 810G standard in promotional materials, as if it’s a real certification – which it isn’t. If it was a certification, it would support the claim that the Armor 3 can survive a 1.2m drop on to a hard surface, and given how robustly the phone is made, we have no reason to disbelieve that. For a little over £200 (or $260), this is a great piece of technology that gives you most of what a much more expensive device can offer, and a few things they often can’t. The battery life, camera, screen and storage capacity are all very good, ticking many of the boxes that people are most concerned about. 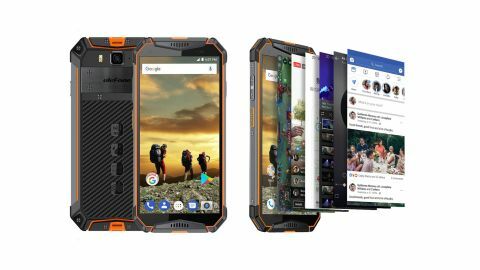 If you want a tough phone for a beach holiday, skiing or trekking adventure, then this one might be a very prudent choice.